رحیمی, حبیب, محمودی, هدی, ملکی, بهزاد. (1397). Estimation of the kinematic source parameters and frequency independent shear wave quality factor around the Bushehr province. مجله ژئوفیزیک ایران, (), -. حبیب رحیمی; هدی محمودی; بهزاد ملکی. "Estimation of the kinematic source parameters and frequency independent shear wave quality factor around the Bushehr province". مجله ژئوفیزیک ایران, , , 1397, -. رحیمی, حبیب, محمودی, هدی, ملکی, بهزاد. (1397). 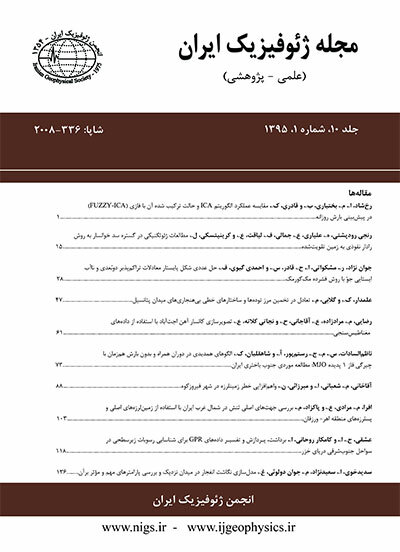 'Estimation of the kinematic source parameters and frequency independent shear wave quality factor around the Bushehr province', مجله ژئوفیزیک ایران, (), pp. -. رحیمی, حبیب, محمودی, هدی, ملکی, بهزاد. Estimation of the kinematic source parameters and frequency independent shear wave quality factor around the Bushehr province. مجله ژئوفیزیک ایران, 1397; (): -. In this paper, the shear wave quality factor and source parameters in the near field are estimated by analyzing the acceleration data in Zagros region. We used the accelerograms which have been recorded by Building and Houses Research Center (BHRC) strong ground motion network. The data have been considered with the magnitude of 4.7 to 6.3 and accrued through 1999 to 2014. We collected the acceleration data which has been recorded by the Building and Housing Research Center (BHRC) strong ground motion network to reach our goals. In this approach, the theoretical S-wave displacement spectra conditioned by frequency independent Q was fitted with the observed displacement spectra. The source spectrum of an earthquake can be approximated by the omega-square ω2 model, which has ω decay of high frequencies above the corner frequency. By following mentioned approach, corner frequency, moment magnitude and frequency independent Q for each accelerogram were computed simultaneously, and the estimated error is given in the root-mean-square sense whole frequency. In this study, the generalize inversion method is used to estimate various source parameters. Thereby, we estimated seismic moment range from 2.89E+23 to 1.21E+26 dyne-cm, average fault slip from 22 to 152 cm and average stress drop from 6 to 136 bars. The path average value Q are of the order Q=151-537. The main objective of this study is determine the source parameters and the shear wave quality factor. In this study, we used the strong motions stations to analyzing the source parameters of 14 occurred events since 1990. In this study, the source spectrum has been estimated based on the omega-square model (Brune, 1970), which has ω2 decay of high frequencies above the corner frequency. Acceleration spectrum is one of the most direct and common function used to describe the frequency content of strong ground earthquake shaking (Hudson, 1962). The source displacement spectrum can be approximated from a displacement record after correcting with diminution function which accounts for geometrical spreading and anelastic attenuation. We’ll achieve the seismic hazard related to the future large earthquake by specifying anelastic attenuation characteristic of seismic waves released during an earthquake. The anelastic attenuations of seismic wave in any area described by a dimensionless quantity called quality factor Q (Knopoff, 1964). Up to now, a few research has been devoted to investigating the issue of attenuation characteristics of the Iranian crust, some researchers have worked on this matter such as Nuthii (1980), Mitchel (1995), Rahimi and Hamzehloo (2008) and Rahimi et al (2010). In the present work, we used the generalized inversion method to acquire source parameters and quality factor of shear waves based on the purposed techniques of Fletchar (1995) and Joshi (2006a, 2006b). In this study, we attempted to obtain two main goals which are included i) to estimate the source parameters by using the acceleration data ii) to estimate the frequency dependent shear wave quality factor in the recorded station by BHRC. In this paper, the shear wave quality factor and source parameters in the near field are estimated by analyzing the acceleration data in Zagros region. We used the accelerograms which have been recorded by Building and Houses Research Center (BHRC) strong ground motion network. The data have been considered with the magnitude of 4.7 to 6.3 and accrued through 1999 to 2014. We collected the acceleration data which has been recorded by the Building and Housing Research Center (BHRC) strong ground motion network to reach our goals. In this approach, the theoretical S-wave displacement spectra conditioned by frequency independent Q was fitted with the observed displacement spectra. The source spectrum of an earthquake can be approximated by the omega-square ω2 model, which has ω decay of high frequencies above the corner frequency. By following mentioned approach, corner frequency, moment magnitude and frequency independent Q for each accelerogram were computed simultaneously, and the estimated error is given in the root-mean-square sense whole frequency. In this study, the generalize inversion method is used to estimate various source parameters. Thereby, we estimated seismic moment range from 2.89E+23 to 1.21E+26 dyne-cm, average fault slip from 22 to 152 cm and average stress drop from 6 to 136 bars. The path average value Q are of the order Q=151-537.